As you can see, it's not the usual image manager. I can do nothing with it, and when I left it, I loose my admin connexion ! I have to reconnect. Anyone can help me please ? Thanks a lot ! Well, is this the DEFAULT OC Image Manager you use, or some extension too ? Do you have any error in browser console? Thanks for your answers. I am new in Opencart, I'll try to answer you as the best I can. The default Image Manager work like a charm in every part of the core part of Opencart, but it do not work in the extensions parts (for ventsScheduler3.0.2.0 and viethemeslivethemeeditor3x). 1) Go in the Image Manager from any part of Opencart admin, like product part. 4) Right click on any visible blue subfolder and click on "open in a new tab" (or directly middle click on your mouse), it will reproduce exactly what I have as Image Manager in my modules ! From here, you can do nothing, button don't works, you can just move to prev/next page. So, to resume my problem : In my extensions, when I call the Image Manager to upload or select an image, it do not show me the default Image Manager windows (with blue icons and usual presentation), it show directly to me the step 4 of the test. I have no error in the F12 console / storage/logs/error.log or nginx/error.log. /edit : I was able to reproduce this in the official demo open cart. Just follow this link https://demo.opencart.com/admin/index.p ... ctory=demo and replace the token by yours. 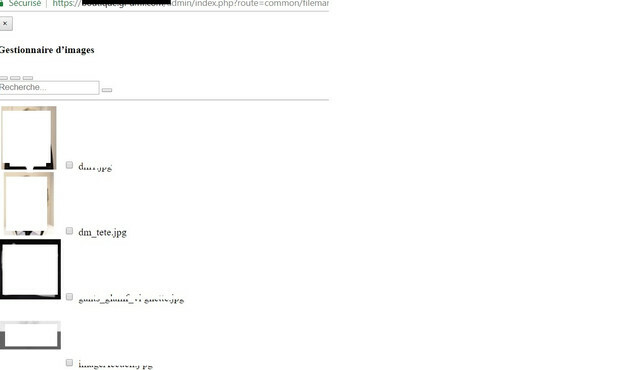 /edit2 : It seem to be the same problem as viewtopic.php?f=201&t=187435&hilit=image+manager . Because I have also (but only with Live theme Editor) this token problem. Download them and upload them each accordingly to your admin folder, clear all caches and see if that resolves the issue. Anyone for an idea ?